This is the section where you, the fans, send in stories of you meeting Albert etc. Send yours to me at Gyrl4Belle@gmail.com. Try to remember what date or even month/year it happened. Pictures are welcome too. Thanks! 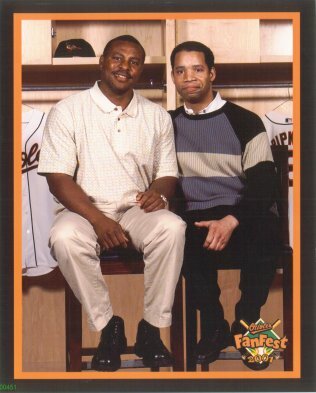 I was fortunate enough to attend the July 25, 1999 game when Albert Belle hit three homeruns at Camden Yards, the third coming with two outs in the 9th inning against Troy Percival. I was wearing my Belle facsimile T-shirt with number 88 and sitting out in the left field stands, about 5 rows in back of where the 2nd homerun landed. Albert lost his chance for the 4th homerun when the pitch in the 10th inning hit him. I nearly missed my flight back to Connecticut that Sunday evening as I waited for another at bat hoping for Albert to win the game in extra innings. It was a magnificent performance for a great, hard working ball player who I truly miss watching. I hope I have the opportunity in some walk of life to meet Albert and thank him for the excitement he has provided and for playing the game of baseball with integrity and effort. I first saw Albert Belle play at Thurman Munson Stadium in Canton, Ohio back in the late eighties when he was a member of the Canton-Akron Indians. I knew when watching him then that he was going to be a special player. I remember all of the spectacular home runs that he would hit in that ball-park. I just couldn't imagine how a young man could hit a ball so hard and far. I went and saw him as often as possible because I knew he would not be playing in that ball park for long. Sure enough he was brought up to the majors with the Cleveland Indians. I had a chance to meet Albert when he appeared at a card show at the Carnation Mall in Alliance, Ohio. He happily signed some personal photographs that I had taken of him while he was playing for Canton-Akron and also a large 8"x10" photograph of himself with a personal inscription to me, and he also signed some baseball cards of himself. Albert was truly a gentleman that day and was very cordial to me. I've followed baseball for 50 years and I can honestly say that I've never seen a hitter have a greater decade of playing baseball than Albert did in the 90's. I may be saying this because Albert played the majority of the decade with my favorite team but he was really awsome and he had alot to do with bringing the Cleveland Indians out of a 35 year slumber. In 1995 he helped the Indians to get to their first World Series in 41 years. In only 144 games the Indians won 100 games and one of the biggest travesties in the history of baseball occured when Albert wasn't awarded the A.L. MVP. To have hit 50 homers and 52 doubles and have a high batting average as he did and lead his team to the World Series,he should have been the MVP without a doubt. Albert Belle should someday be in the Hall Of Fame. For him not to be will be another travesty.I've met Albert 3 times since he has retired. Once I met him going through the Cleveland Airport while I was working there as a Transportation Security Officer and twice at the Phoenix Airport. He was very cordial to me all 3 times and even agreed to play ping pong with me If I wanted to. Ping pong is a favorite game of his. I no longer live in Arizona so I guess I missed my personal chance to play Ping Pong with my greatest hero. I ventured to FanFest 2001 with the intention of having Albert Belle enter his name on title page of my favorite hardback film study book as a compliment to his superstar status in the world of Major League Baseball. His all-out style brought me back to Camden Yards to see exciting Oriole Baseball from his perspective in right field. I was fortunate enough to see him hit a homerun in the only post-season game I have attended up to this point in 1996. I was even more fortunate to see his triumphant return to the Oriole line-up versus Toronto on September 26, 2000. The few words we shared during the autograph and photo sessions at FanFest 2000 became a point of interest to the fans in attendance mostly because we were laughing and joking like bosom buddies. As a result, I was very determined to get a Hollywood-type photo with him in 2001. Afterwards, he played another joke on me but I was able to move through it without a flicker of a response. It may be nothing great to some of you, but Albert Belle made my son the happiest kid in the world on Saturday (October 2, 1999) night. Belle happens to be Sting's favorite player. We came in one gate for Saturday's game. Mike Bordick, Mike Timlin, Charles Johnson and someone else who escapes me were at that gate. So, we walked to the other gate to see who was there. Jason Johnson, Brian Falkenborg, Brady Anderson and LO And Behold! Albert Belle were at that one. Belle was surrounded by people and was very busy handing out carnations to the women. He was smiling, but not really saying anything to anyone. He had his baseball cap on backwards and he almost looked like a kid; not intimidating at all. Sting wanted to say Hi to him, but was too bashful to go up to him. He kind of shuffled over to him, but stayed on the outskirts of the crowd. Albert had turned around by the time Sting was up to him. So, I took hold of Sting's shoulders, walked him right up to Albert and called out his name. He turned around right away. I told him that my son just wanted to say hi to him because Albert was his favorite player. Albert smiled and extended his hand to shake hands with Sting. Sting was in disbelief most of the game and I'm not sure he's gotten over it yet. Although I didn't think Sting would ever wash his hand again, he has. 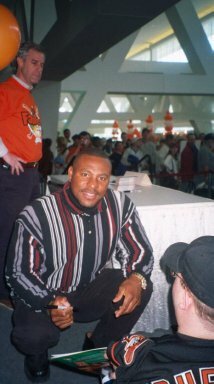 I'm not a huge fan of Belle but I have a 4 year old son who I took to this past year's fanfest(1999)-he wanted to see Brady Anderson so bad and he wasn't there, he sat in the middle of the place and cried and Albert Belle came up to him and asked what's wrong he told him and Albert sat down on the floor with him and talked to him until he stopped crying and told my son that he would let Brady know that he was there. I don't care what people say about him he's my son's hero and that makes him a good person in my book. I have to say that I was a little star struck when I met Albert Belle. He is portrayed in the media as an ogre that is only concerned for himself. I never did agree with the media however, Saturday January 22,2000 proved that my disbelief was accurate. I made plans to go to the Orioles FanFest and did not arrive until around 1:45 p.m. When I got there I saw a sign that Albert Belle had signed autographs from 12:30 -1:30p.m. Needless to say I was an unhappy individual (Albert Belle was the only reason that I braved the cold to go). I walked around for a little while looking at the displays and bought a few AB related items and was getting ready to go back out into the cold. You see I did not drive because I did not want to look for parking so I parked at the light rail station and rode Mass Transit downtown. Anyway, I was getting ready to leave and happened to walk past someone as they said AB was taking pictures upstairs. I flew up the stairs and the line was so long that the attendant told me to stand in the overflow line and maybe I would get a chance. They were afraid to let a lot of people go ahead because they did not want to have Albert turn people away. I got through the line and saw that Albert was so cordial. He smiled a lot even though he was sitting on the chair for so long. It looked like his knees were in need of being stretched but he continued smiling and taking pictures. He is a great guy and my favorite player. I hope that this year the media can leave him alone and let him do the job that he wants to do. I have been of a fan Albert Belle since 1992, and hearing so many negative things said about him by teammates and the media, I was naturally nervous about meeting him. But still, I don't believe that any one person can be as bad as all of that, I went to the Fanfest 2000 in Baltimore. Now in the papers you will read that Albert doesn't have one good thing to say about his fans. Why then, did Albert arrive 30 minutes early of the scheduled time to sign autographs? Not only did he arrive early to sign, he stayed past his scheduled time to finish signing for his anxious public. Every now and then people in wheelchairs were brought up to the side of the desk where he was signing and he would sign for them as well. I took advantage of this opportunity and politely asked Albert if he would let me take his pic. He was so nice. He said Yeah, sure, take the pic. Would a guy who hates his fans do this? Later, it was my turn to get an autograph, I said hello and asked if he would sign. He expressed interest in my being there and leaned over the desk so that we could get our pic together. He shook every ones hands as they went through the line and made conversation with them. Once again, would a guy who hates his fans do this? Later I got my pic with him at a different location, he shook hands, said hello and was just totally friendly. As a fan, I have to say that I was ashamed of myself for thinking that he might say or do something mean. He didn't, and that was my best trip anywhere yet. By the way, when I got back home, I emailed him a letter saying thank you for being so cool. Wouldn't you know that guy emailed me back? He is just way too cool. 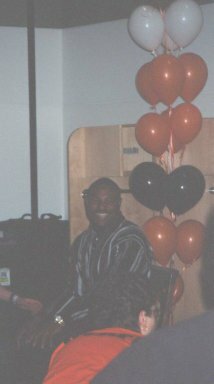 David was nice enough to send in these pictures from Fan Fest 2000. Thanks! 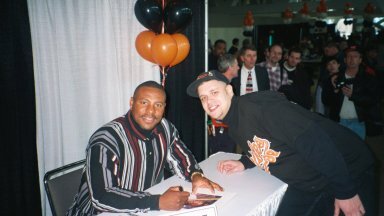 I attended the Orioles fanfest in January 2000 and had the opportunity to meet Albert Belle. I was nervous about meeting him because of what I had read about him. MR. BELLE was nothing like what I had read. He signed my ball, he smiled and thanked me for coming. I asked him could have a picture with him and he said yes, and I leaned in and my mom took the picture. I thanked him and he said he hoped I enjoyed the rest of the day at winterfest. MR. BELLE is the coolest and the greatest in my book. My mom even enjoyed meeting him. These were not sent to me, but I found them on the web and thought I would share the links.